At baseline, fundus photography showed minimal macular changes (fig 1); however, the mfERG revealed significant macular dysfunction. A full field ERG performed in March 2000 revealed a reduction of approximately 30–40% in rod and cone responses, with the predominant effect on the b-wave amplitude in comparison with normative data (DTL electrode, dilated pupils, recorded according to ISCEV standards). No anomaly of latency was observed in either the mfERG or full field ERG recordings. 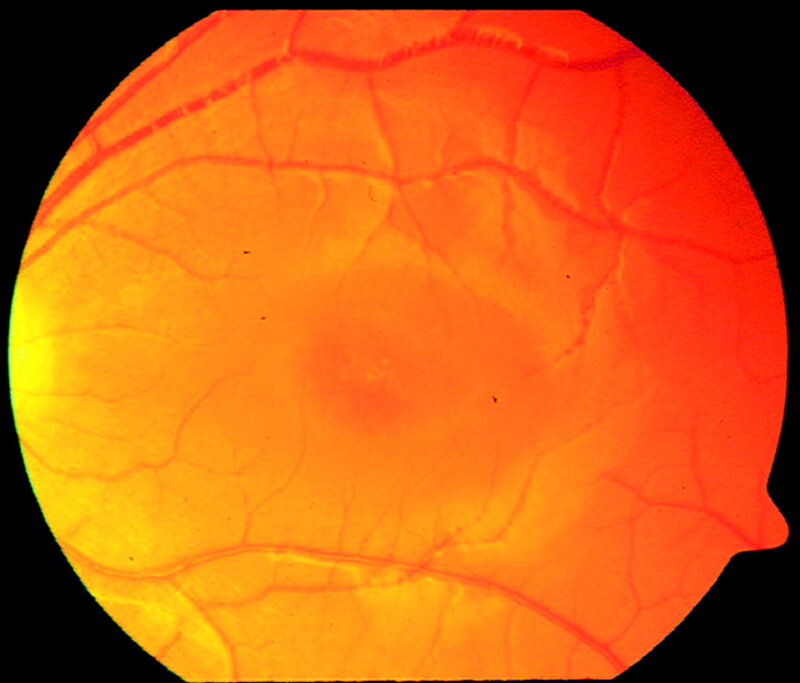 Fundus photograph of 15 year old patient at baseline examination. Peripheral blood samples were taken in a non-fasting state at the beginning of the study. Her baseline plasma DHA level was at the low end of the median for a North American diet, 24 μg/ml; whereas her omega-6 arachidonic acid was 76 μg/ml. Her plasma DHA level increased after 2 months of supplementation to 86 μg/ml (fig 2). She reported progressive subjective improvement in vision on the VF-14 questionnaire. Analysis of the mfERG tracings revealed that an improvement had occurred in amplitudes from the foveal and parafoveal regions of the macula (fig 2). For this study, we accepted the group average response of rings 1–2 (0–5°), and rings 3–5 (5–25°), derived from a 63 hexagon stimulus (Veris, San Mateo, CA, USA), as simulating the foveal and parafoveal responses respectively. Visual acuity improved from 20/200 to 20/100 only in her left eye with the DHA supplementation. Effect of DHA on retinal function in patient with ELOVL4 mutation. Unfortunately, she lost interest in the study, became non-compliant despite our encouragement, and was lost to follow up from August 2001 to the end of March 2002. She returned after perceiving that her vision had declined since halting the DHA supplementation. Repeat plasma DHA testing confirmed that her plasma DHA had dropped to levels approaching those from the beginning of the study (35 μg/ml, fig 2). Supplementation was once again initiated. After 4 months (July 2002), she showed the same improvements in visual function both subjectively (VF-14 score) and objectively (mfERG amplitudes, fig 2), coincident with an increase in plasma DHA. The patient’s visual acuity again improved only in the left eye from 20/200 to 20/100. Another full field ERG was conducted in July 2002 to compare with the diagnostic series from March 2000. The amplitudes of the photopic b-wave and the scotopic b-wave both improved by 30%, averaging both eyes. The scotopic mixed rod-cone response showed increased amplitude of the a-wave by 85%, and b-wave by 46%, when responses from both eyes were averaged. These results could not be explained by intervisit variability and suggest the effect of DHA supplementation occurs beyond the macula, over the entire retina. The patient’s young age, low dietary intake of DHA, and a mutation in ELOVL4 may have particularly predisposed her to an early macular degeneration. A longer experience with DHA supplementation in young patients with Stargardt-like macular dystrophy could determine if DHA supplementation can alter the natural history. The technical assistance of Peggy Kaminski, OMT, YK Goh, PhD, and Ezekiel Weis, MD, is gratefully acknowledged. Zhang K, Kniazeva M, Han M, et al. A 5-bp deletion in ELOVL4 is associated with two related forms of autosomal dominant macular dystrophy. Nat Genet 2001;27:89–93. Salem N Jr, Wegher B, et al. Arachidonic and docosahexaenoic acids are biosynthesized from their 18-carbon precursors in human infants. Proc Natl Acad Sci USA 1996;93:49–54. Mackenzie PJ, Chang TS, Scott IU, et al. Assessment of vision-related function in patients with age-related macular degeneration. Ophthalmology 2002;109:720–9. Hargreaves KM, Clandinin MT. Phosphatidylethanolamine methyltransferase: evidence for influence of diet fat on selectivity of substrate for methylation in rat brain synaptic plasma membranes. Biochim Biophys Acta 1987;918:97–105. Grant support: MSI Foundation, Alberta, Canada; University of Alberta Hospitals Foundation, Olive Young Fund; Royal Alexandra Hospital Foundation; Canadian Institutes for Health Research (MH Fellowship support).